When storms come, it may be far too late to do what you need to do. Although some things, such as adding extra lines, can often be done within a few hours of the expected blow, other things should be done well in advance. Many of these are important not only to survive a particular storm but also for your overall boating safety. Here I’ll discuss some of the steps you should take for basic readiness. What you ultimately do will vary with your boat and many other circumstances, but this should give you some ideas. Many of the most obvious things on a boat are sometimes overlooked, often resulting in disaster. For example, most boats have scuppers. 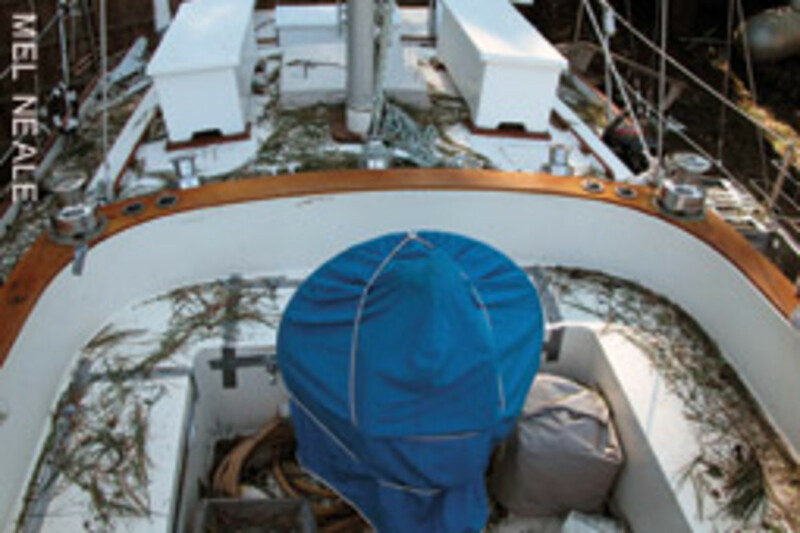 If the scuppers are in the cockpit, or if you have an open boat, and they become clogged with leaves or other debris, rain can cause the boat to sink. 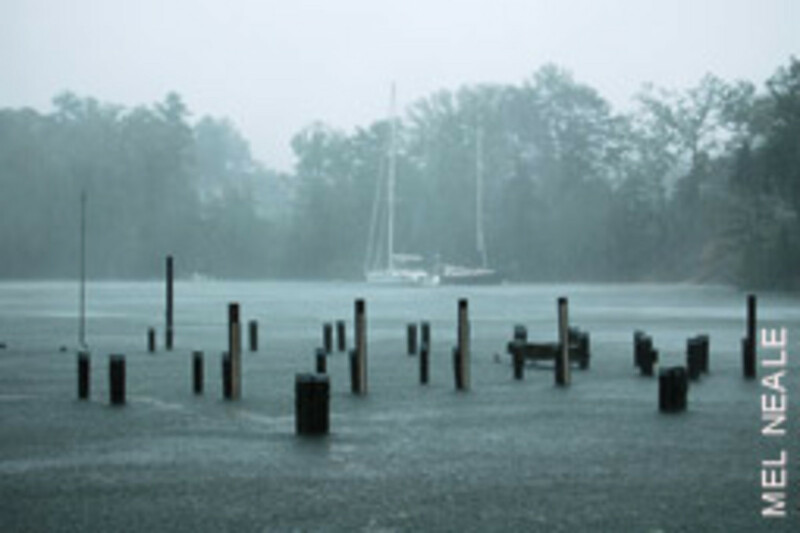 Even if your boat is ashore, enough rain could fill it and cause huge damage. It’s important to clear your scuppers before a storm, but also take steps to be sure they don’t become clogged during the storm. 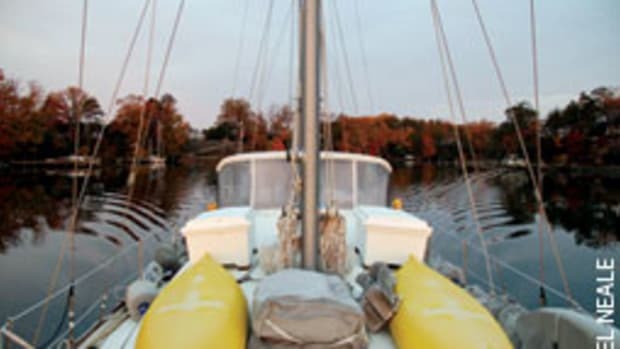 If your boat is docked or stored around tall trees, there is particular cause for concern. One method of protecting your scuppers is to cover the area upstream of them with large pieces of screen. However, even this, as simple as it sounds, must be done carefully, and the screen must be large enough to accommodate a lot of leaves. 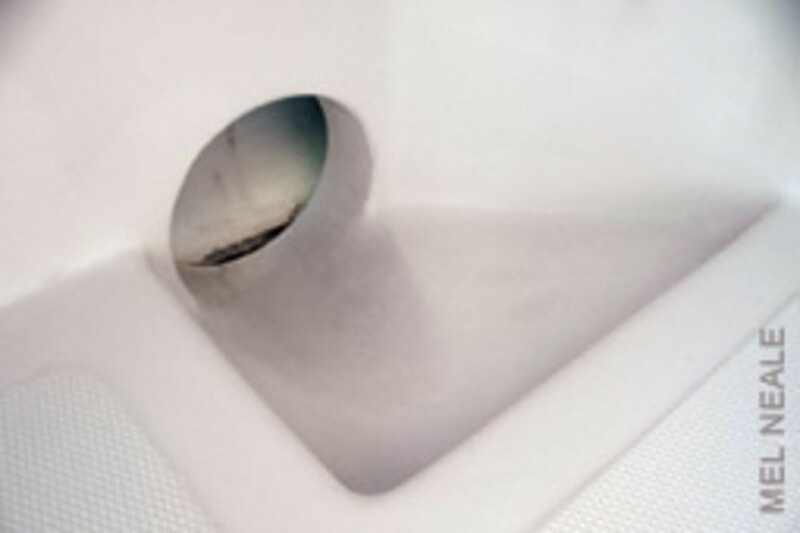 Don’t rely on bilge pumps to take care of clogged scuppers and other drains. A long deluge, coupled with a power outage and the extra drain on the batteries, can render those bilge pumps useless. You boat should have more than one bilge pump, and each should be on its own wire circuit and circuit breaker, and have a separate protected float switch. Beware of some of the new float switches, which rely on exotic sensors or other electronic components that are in the bilge and below the water level of the bilge at times. It’s been my experience that electronics don’t work well for long down there. Check your bilge carefully to be sure nothing will interfere with the operation of the float switch. Also, before the storm, partially flood your bilge with a dock hose to be sure that the pumps and switches are working — not just coming on when they should but also turning off when appropriate. A constantly running bilge pump can deplete a battery when the charger has lost power. Check your boat for places where rain can enter. Some of these may surprise you. For example, many center consoles have storage areas along the sides under the decks that can allow hard-driving rain to find its way into the bilge. Some cabin boats have wells in their side decks that can trap water and allow it to run inside, even though those wells have small scuppers. 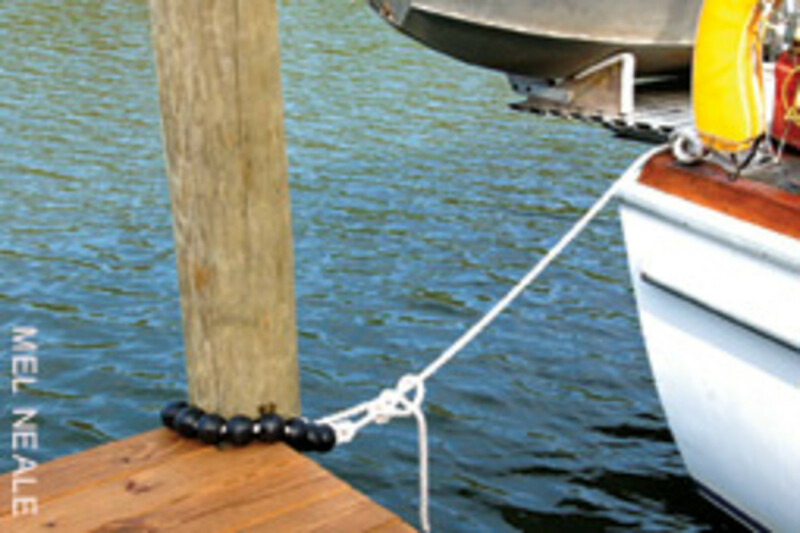 Many boats have one-way valves installed over transom scuppers to help prevent water from back flowing into the boat and potentially flooding it. These valves range from rubber flaps that hang outside the hull and over the hole to more complex models. While these are a good idea, there is the extra potential for debris to block water flow. Take care that they remain unobstructed. Some boats have built-in problems that should be modified if you’re going to stay in the water during a storm. For example, it’s not unusual to see boats with chocks that are so small you can’t get an adequate-size rope through them, never mind chafing gear. Also, many cleats are too small to accommodate rope of adequate size to tie off in a storm. Even if your cleat is large enough, the backing behind it may be inadequate. For example, it’s often a thin and fragile piece of fiberglass. Sometimes it’s wood. Sometimes it’s aluminum that has corroded because of its proximity to stainless bolts. It’s preferable to have heavy stainless steel backing plates as wide as the area allows. It’s also important to have enough cleats in the right places on deck. For example, many boats do not have adequate cleats to rig good spring lines. 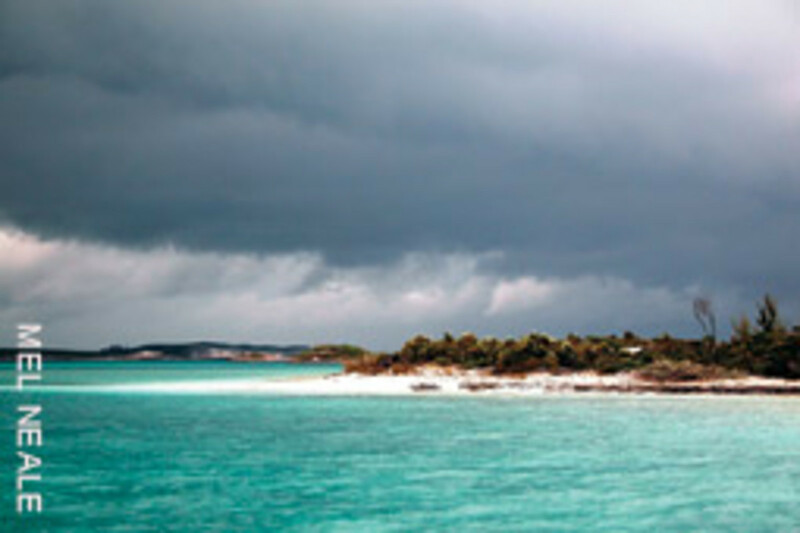 Any one of these problems can cause the loss of your boat and serious safety issues — even during normal operation — and should be fixed well before a storm. Many outboard boats have very low freeboard at the stern, making it easy for waves to wash over, particularly if the stern is weighted down by a heavy engine. If you have a boat such as this, be sure that the hatches to the between-decks area are secure and tight enough so they won’t leak, even under standing water. These are often screw-on hatches with O-rings or other rubber seals that deteriorate over time and need to be replaced. Check your batteries and charge them properly. If there is any doubt about their ability to hold a charge, replace them. If your boat has only starting batteries, they probably aren’t designed to take heavy sustained loading from one or more bilge pumps. 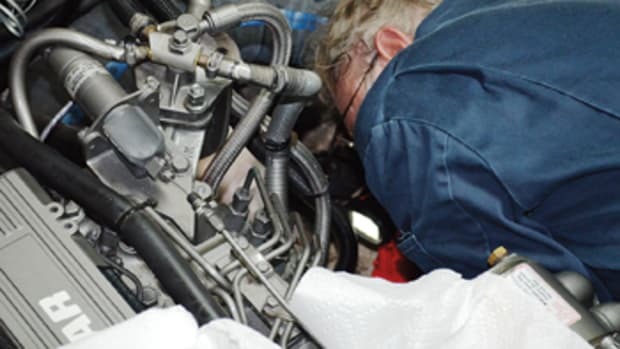 Your starting battery may have served you well over the years, since it’s been regularly serviced by its battery charger for the limited purpose of starting the engine. But you must always assume shore power will be lost in a storm, and your batteries will need to be deep cycling in order to take the sustained drain of running bilge pumps. Water is not your only enemy. If it doesn’t get you, the wind might. To minimize risk, take in or secure canvas and sails, large areas of glass, Biminis, wind screens or anything else that could be damaged or could cause damage in high winds. Also, consider exhaust pipes and other through-hulls that crashing incoming seas could adversely affect. I’ve seen large boats with their engines flooded by seawater because waves, in conjunction with storm-driven currents, pushed water up into the exhaust pipes, over the riser and into the engine. I’ve also seen boats flooded or partially flooded because they remained heeled over for long periods of time in high winds. Through-hulls, such as those for a galley sink, were left open, and water came in. Of course, you never know for sure from which direction the winds and the seas are going to come, but there are things you can do to provide for various contingencies. An example that comes to mind is the flap over the exhaust pipe. Many boats have these. If yours doesn’t, you might consider getting one. Keep in mind that these become stiff with age, and you may want to replace yours before a storm. Some owners, when they are expecting particularly bad blows, will plug an exhaust line or other large through-hull opening. You can do this by inserting a wooden plug or closing down inside valves, depending on the type of opening. If you do this, it’s critically important to attach a reminder to the starting button or some conspicuous area to warn you that the plug is still in place. We all know to use lines of sufficient size and strength. We all know that lines should be new or new enough so that there are no areas of chafe or brittleness or other weakness. We know that it is preferable to double up, perhaps even triple up, on the lines. Most of us know that our dock lines need to have enough elasticity in them; thus, nylon is far better than poly-pro, which is a definite no. But many forget about the chafing gear. Even the best line can part in a very short time if the chafing gear isn’t adequate. The problem with chafing gear is that it, too, will wear through. That’s its job. And you’re not going to be on the boat, or if you are you’re probably not going to be able to replace the chafing gear during a storm. So do the best you can, well before the storm. Choose your chafing gear carefully. Many believed fire hose was good because of its toughness and because of the plastic or rubber liner inside. But experience has indicated that unless chafing gear allows water to soak through to cool and lubricate the area around the rope, it may actually make the line brittle or cause it to burn because of the heat inside. Many are now using folded-over blue jeans or similar material that is tough enough to take the chafe but also will let rainwater through. Whatever you choose, it’s important to tie the material to the lines to help prevent it from slipping out. During many storms, we’ve rigged multiple sections of chafing gear so that if one wears through we can let out a little more line to position the next section in place. Of course, this presumes you are on the boat or have access to it during the storm. Often this is impossible or dangerous. I’ve discussed the points on your boat where you will secure your line. However, the points to which you secure lines on the dock are just as important. I’ve always felt that it’s best to tie directly to pilings. These are, or at least should be, the strongest part of a dock structure. Some docks have cleats on their pilings. These not only inhibit your line from rising and falling with the water, but unless they are through-bolted, they are also susceptible to being pulled out. If they are through-bolted, there is the risk that this has weakened the piling. Some marinas provide cleats on the dock itself. If the cleats are merely through-bolted to a plank, be very wary. If the cleats are bolted through an overlapping series of stringers under the dock, they should be much more secure. Well-built floating docks, if they’re in a protected area, are preferred by many because they rise with the surge, assuming the pilings to which they are attached are high enough. But even with these, be sure that the cleats are properly attached to the dock, or tie your boat to those pilings, if appropriate. I’ll never forget the situation in one hurricane when the tidal surge was so high that it lifted the entire floating marina, including the boats, over the pilings and dumped it ashore. While preparing your boat, you, unfortunately, may also have to check and prepare boats around you. If you see a boat upwind that has a lot of loose debris on deck, you may want to call the owner or take other appropriate steps. The debris can become flying missiles headed for your boat when the winds come up. You may look around the dock and see that other boats are tied to pilings with frayed or otherwise inadequate line and are just waiting to demolish yours. Usually the best course of action, if you can’t find a responsible owner, is to tell the marina personnel and ask them to secure the boats. Many marinas have contract language that allows them to board vessels and properly secure them if the owners have not done so. The marinas usually bill the owners for the service. If you see a problem, check with your marina. Yet another area of serious concern is the tidal surge you might expect. Whatever it’s going to be, you’ll have to prepare for it. The size of your slip, the type of boat you have and the size of the pilings will come into play. We’ve started using Tide Minders (www.tideminders.com) and found them to be very helpful. These are very tough round balls with holes in the middle. Your line passes through the holes, and they essentially form a necklace around the pilings that rolls up and down with the surge. If rigged properly, they not only let your boat ride up and down with the water, they also help to absorb energy from wind gusts and waves. Your pilings must be tall enough to allow the lines to roll up and down, but they should be that tall, anyway. Spring lines are also important. Some believe that if you have devices such as Tide Minders, spring lines are less critical, but we always rig them. One purpose of spring lines is to keep the boat from moving too much forward or aft. 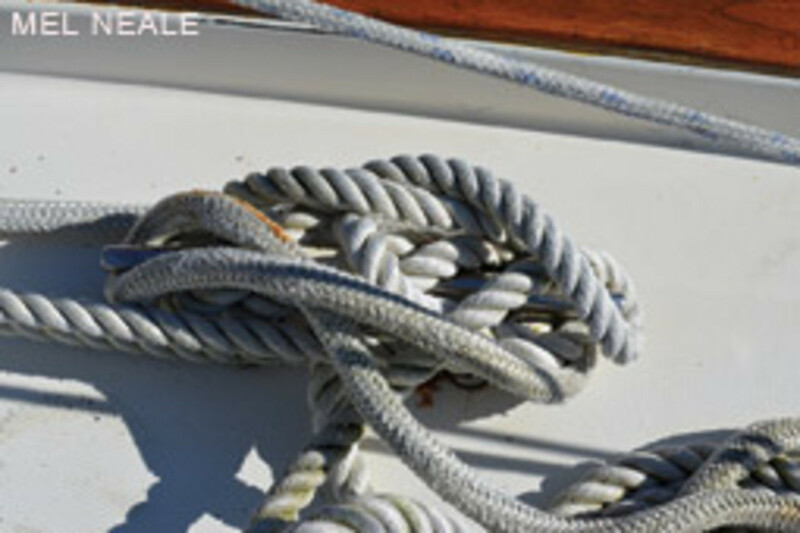 As with many other boating skills, there is an art to rigging spring lines well. Take time and practice with your boat and your dock so you’ll be ready when preparing for the big one. The number of boats in lifts that have been lost in storms is quite surprising. I mentioned some of the precautions you should take to protect your boat from the wind if it’s in a lift. But perhaps of greater concern is the damage that occurs when the lift isn’t high enough to accommodate storm surge. Of course, rising water can lift the boat off the lift and leave it in a position where it is damaged and becomes flooded. Even if the surge doesn’t float the boat out of the lift, waves that strike the bottom of the boat can cause great damage. A boat on a lift also can be damaged if rain floods it because of blocked scuppers or a bilge pump failure. Remember that in a storm we often lose power. When this happens and the battery charger quits, the bilge pump may also soon stop. Don’t think that you’re going to be OK just because your boat is on a lift. You may not sink, but you may still suffer damage. For example, as water collects in the boat, it becomes heavier and heavier. This can break the back of the boat or even collapse the lift. It’s also important to have your boat tilted in the lift so the water will run out of the scuppers, which are probably in the stern. If the wind is able to rearrange your boat in the cradle of the lift, the angle that she lies may be changed, and all or a part of your boat may be flooded. Unless your lift is high enough and strong enough and you are prepared to spend the time and money to equip your boat to survive a storm in the lift, it may be much safer to store it ashore. Many think it’s best to haul your boat out on a trailer or have a yard haul it. BoatUS insurance generally recommends hauling a boat. 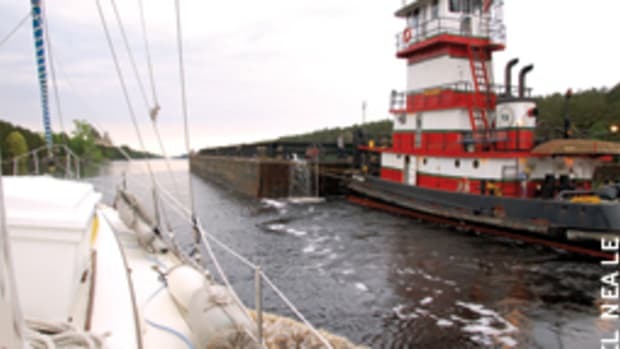 It will even share the cost of moving the boat to a yard or ramp, as well as the cost of hauling it, and give you a better deductible if you stow it ashore and meet BoatUS requirements. For more information on these issues, click on “Resources” at www.boatus.com. However, in some circumstances, many believe it may be safer to leave the boat in the water. This is a tough call that often can be made only by an experienced person at the scene. 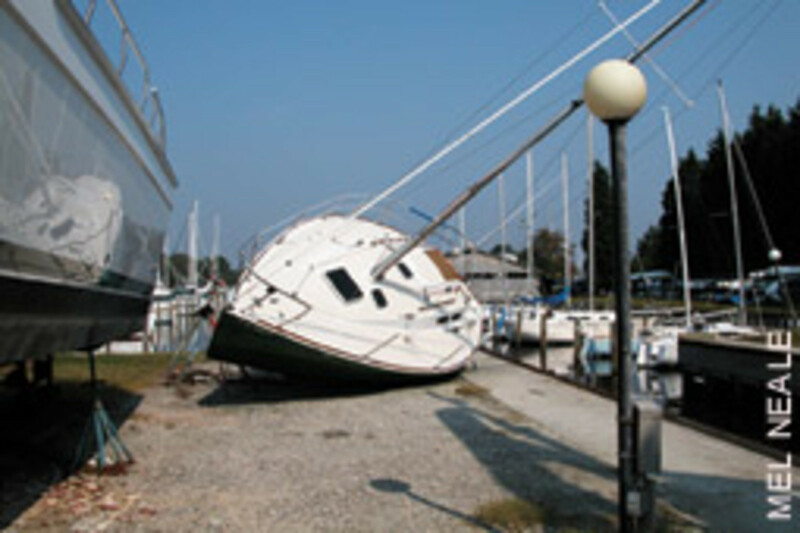 Factors that should be considered include the height of the ground and hills around the dock where the boat would remain in the water, the protection around the dock, the strength of the dock, the danger of other boats or debris breaking loose and blowing down on the boat, and the type of boat. In many areas, there is no room at haulout yards when a strong storm is coming. Some yards require large deposits well in advance to make a reservation to be hauled, and these deposits may be non-refundable. Or you may have a boat that is too big to be hauled by the facilities near you. If you’re able bring your boat ashore, there are many precautions you should take. Any boat, large or small, that’s ashore should be securely tied down to reliable anchors in the ground. There should be at least four tie points, preferably more. Many yards provide this as a part of their service. 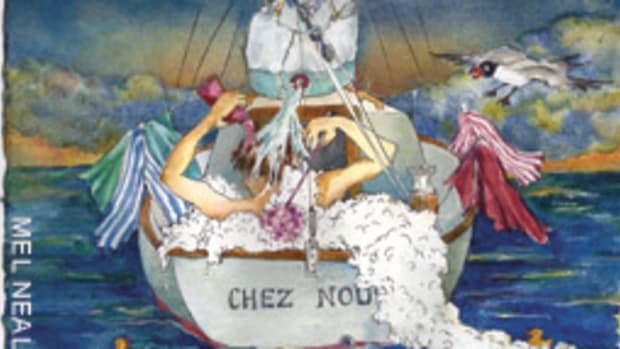 You still must take the precaution of removing loose objects on deck, sails, canvas and other things that the wind could destroy or that might add windage, which could topple your boat. And remember that boats around you, if not properly prepared, may topple and damage yours. Even if your boat is on a trailer, it should be tied down to secure anchors in the ground. If your boat is to be stored on jack stands, be sure the stands are adequate, in good shape and well placed. 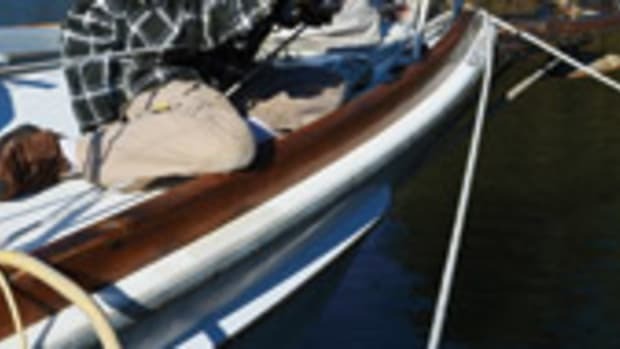 A stand positioned against a thin layer of fiberglass which has no support behind it in the interior of the boat, could damage that area as the wind buffets the boat. Also, be sure the chains securing the stands are in good shape and numerous. Normally these precautions are part of the services offered with the haulout, but it doesn’t hurt to double check. And don’t overlook the ground underneath the stands. Is it sandy? Is it sloped? Is water from the storm going to run beneath the stands and undermine them? If you have an open boat or an open cockpit, it will be important that the scuppers are clear and and that the boat is angled so water will drain. There has been much debate, particularly after Hurricane Sandy, about whether it’s better to leave transom plugs in or take them out of boats stored ashore. Most people have preferred to remove them so water will run out. However, Sandy’s surge was so high that the water flooded into open drains, sinking many boats. Sandy presented a unique situation, and this particular call obviously will depend on the circumstances. It is, however, one more potential peril for which you must prepare. What I’m going to say next might not sound interesting, but once you get into it you may be surprised. I’m talking about reading the fine print in your boat insurance contract. All insurance contracts are far from equal, so it’s important that you know what you’re paying for. You may be very happy with your policy, or you may feel that you’re getting ripped off. But unless you’re really into paying lawyers, you should read the language of your contract before you need to file a claim. Look for differences in the deductible for damages caused by a named storm. Some policies are not using the phrase “named storm” but are using broader terms that create expanded opportunities for deductible increases. Also, look for coverage clauses related to salvage and wreck recovery. If your boat sinks in the slip or elsewhere, it probably will be considered an environmental hazard, and you could be forced to pay to remediate this. The cost could be staggering. Coverage for fuel spills may be of vital importance after a storm. 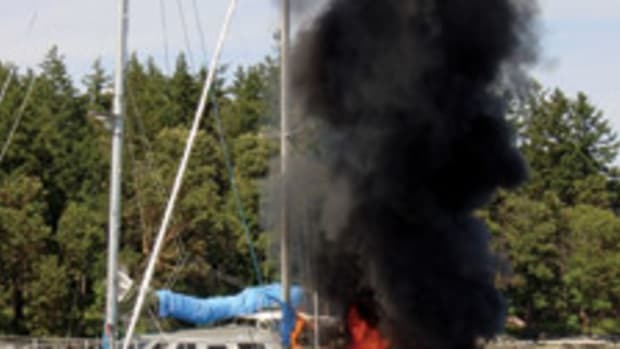 If your boat damages other boats, the owners of those boats or their insurers could come after you, and some policies do not cover “consequential” damage. These are just a few of the potentially costly issues you should consider when selecting or re-evaluating your insurance. Also, pay particular attention to what your insurer requires of you. Typically you will be requested to take certain steps to reduce the risk of damage, other steps to mitigate damage should it occur, and other steps to notify and cooperate with the insurer. Failure to do any of these could enable your insurer to say it doesn’t have to pay you any money. If you have a very “cheap” policy, carefully compare its language with the language and coverage of more expensive policies. If you have questions, call an underwriter. The prospect of a storm raises anxiety, but being prepared for it will give you added peace of mind, as well as protecting your boat and potentially saving you a lot of money. There is no way any one article can cover all of the contingencies — and I’ve obviously left out some important issues, such as anchoring techniques and lightning prevention. Your boat can only be safe when you’ve carefully considered these and other tips as they apply to your situation. But the “big ones” do come, so it’s best to be ready.